Zentangle for K idz! is CZT® Sandy Steen Bartholomew’s latest Zentangle® book. Using a comic book style, written and illustrated by Sandy, Sandy helps kids discover how to draw “cool stuff”. Cute cartoon characters, named Alex and Lilah after Sandy’s own children, guide kids through the easy steps of creating a Zentangle®, and patterned drawings that requires nothing more than a pencil, pen, paper. Zentangle for Kidz! is full of colorful kid-friendly illustrations that kids will find fun to follow and explore their own imaginations through drawing. For those curious about the tangle patterns, by my count there are 47 tangles of which 17 are official Zentangle® patterns (including the first appearance of instructions for Dyon) and the rest are from Sandy’s previous books, Totally Tangled, and Yoga for Your Brain . Sandy illustrates the steps for each tangle and uses tips and a variety of cartoon characters to help children make their way through the instructions. She gives tips on shading, adding auras, using shapes and letters for strings, and drawing basic zendalas. 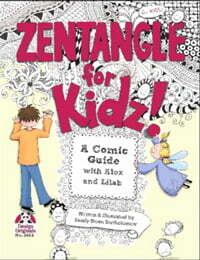 Unlike Sandy’s two most recent books, Zentangle for Kidz! is the larger Zentangle-series (by Suzanne McNeill) physical dimension of 8.5 x 11-inches, and contains 20 pages including covers. Zentangle for Kidz! makes a great gift for any young child and might just spark a generation of contented tanglers. What could be wrong with that? 1 comment to Zentangle for Kidz! This is a fabulous book!! This was the first I bought because it is full of fun and color. It makes this “big” kid enjoy tangling more and more. Thanks!